family room, hotel and even next to your favorite recliner. Compact refrigerator with small freezer compartment, shelf and storage in the door. The original "Safe Refrigerator™" is created by Eddys Garage. It looks like a real locking safe. The authentic dial on the front even spins. 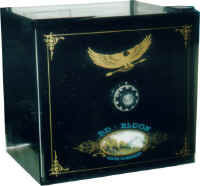 This small compact refrigerator is trimmed with mirror gold flourishes, an eagle and a scenic view mural on the front. Keep your snacks and beverages cold in this NEW safe looking compact fridge.